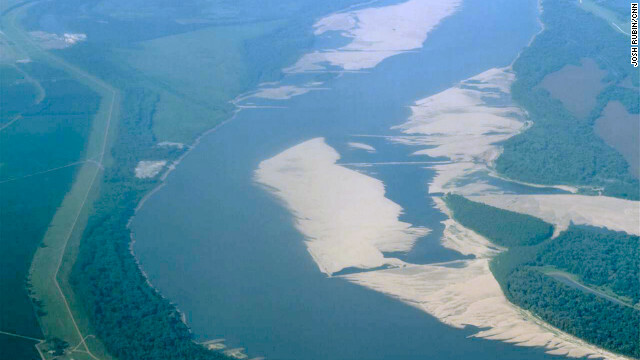 An aerial photo of the Mississippi river shows sandy areas where water had been before the drought. The river's levels are now nearing record lows. The "mighty Mississippi" has lost some of its might with the season's epic drought taking its toll on river levels, which are falling to near historic lows. The U.S. Army Corps of Engineers will spend nearly $7 million dredging in an attempt to keep ports operational and keep the river open for barge traffic in the coming weeks. River levels in Memphis have dropped to within three feet of their historic lows from the 1988 drought. In just one year, the river has gone through extreme fluctuation. Last May, it was within a foot of its record-high crest because of massive flooding, and today it's 55 feet lower and experiencing historic lows due to drought. Dramatic images taken from NASA’s Terra satellite show the swollen river in late April of last year compared with images from early July this year. The expanse of the water was over 3 miles wide in parts of Missouri and Arkansas as levees were blown up in order to help protect the town of Cairo, Illinois from flood waters. The image taken July 2012 this year shows a much different story with the river less than a half mile wide in spots. 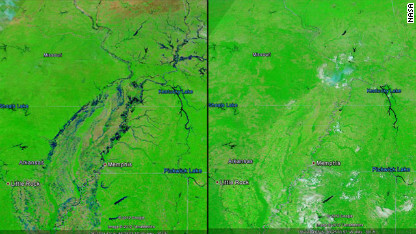 NASA’s Terra satellite shows the Mississippi River late April 2011 compared with images from early July 2012. New data from U.S. Drought Monitor issued Thursday shows the drought has worsened in the past week, and now ranks as the second worst drought in U.S. history over the lower 48 since records began in 1895. Nearly 64% of the contiguous United States is now in moderate to exceptional drought, second only to the summer of 1934, the height of the dust bowl era. Nearly 40% of the corn crop is now considered in poor or very poor condition, and this went up a sharp 8% in only a week. During the 2012 crop year, the U.S. Department of Agriculture (USDA) has designated 1,297 counties across 29 states as disaster areas, making all qualified farm operators in the areas eligible for low-interest emergency loans. And on Monday the USDA designated 39 additional counties in eight states as primary natural disaster areas due to damage and losses caused by drought and excessive heat. A dozen states on Thursday were under some sort of heat advisory or warning, many of them over the worst-hit drought areas. The heat wave is expected to last through much of the weekend, which means conditions will likely continue to worsen over the coming weeks. And the Army Corps said that the shrinking of the Mississippi means that saltwater is beginning to work its way upriver, which could threaten some water supplies. That's not unprecedented, and there's no current threat to water supplies, but officials are prepared to start building an underwater barrier to block the denser saltwater from moving further upstream, Corps spokesman Ricky Boyett said Friday. The Corps last had to do that in 1999, he said. It looks like nature has decided to impose its carbon tax on the middle states who refuse to abide by international treaties to protect the global environment. I can't say I feel sorry for anyone in those states who keep voting for the science denial party. THIS WAS NOT CAUSED BY MAN-MADE GLOBAL WARMING!!! Rush Limbaugh said it wasn't on his HUGE radio show! Yes, primarily caused by Rush's hot air.